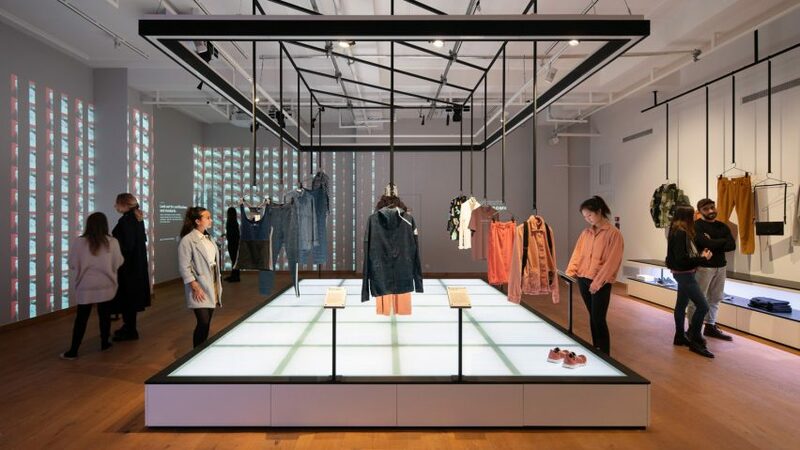 Fashion For Good is an interactive museum that aims to teach visitors about innovations in the fashion and textiles industry, designed by US-based studio Local Projects. 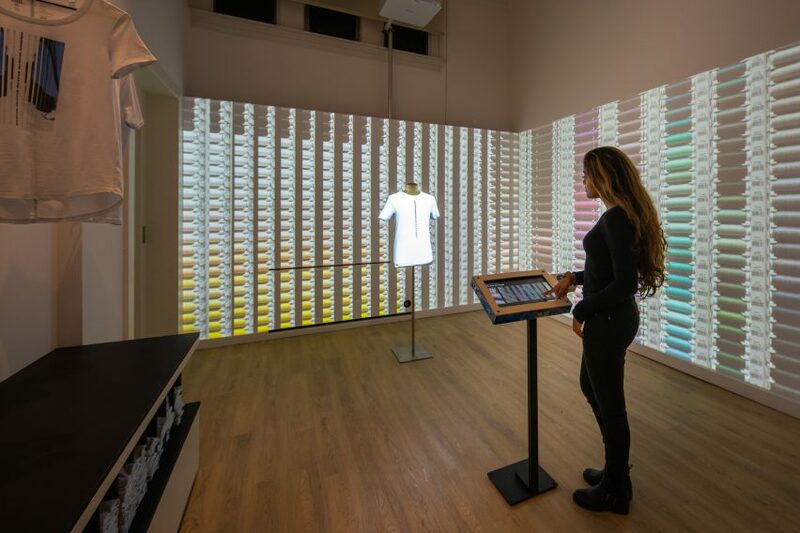 The museum in central Amsterdam, which opened on 5 October, consists of interactive exhibits that aim to teach visitors about responsible fashion. 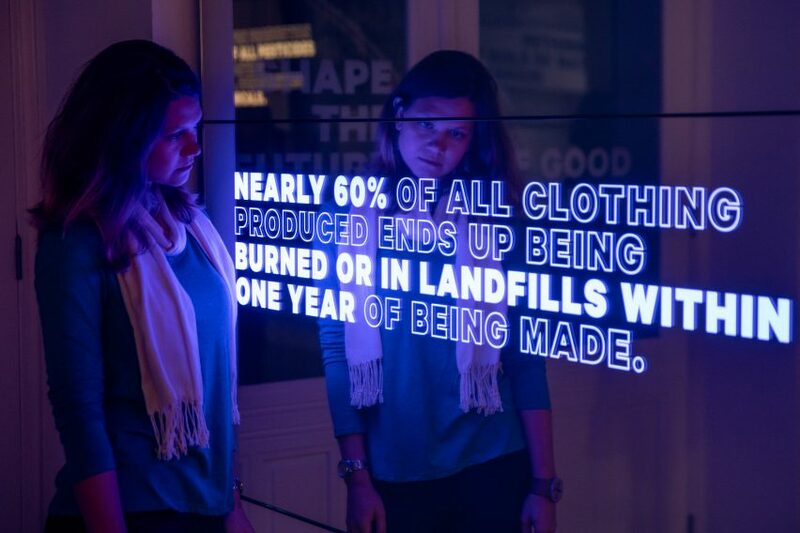 Fashion for Good’s displays, created by Local Projects, are designed to change people’s buying habits by demonstrating the wasteful practises of the fashion industry, as well as showing them how they can have an impact themselves. In the Innovation Lounge, visitors are introduced to around 50 innovators that have sought to disrupt the fashion industry. These include Colorfix, which dyed a dress for a Stella McCartney collection using engineered micro-organisms, and Mycotex, which made an outfit from mycelium, a material found in the roots of mushrooms. 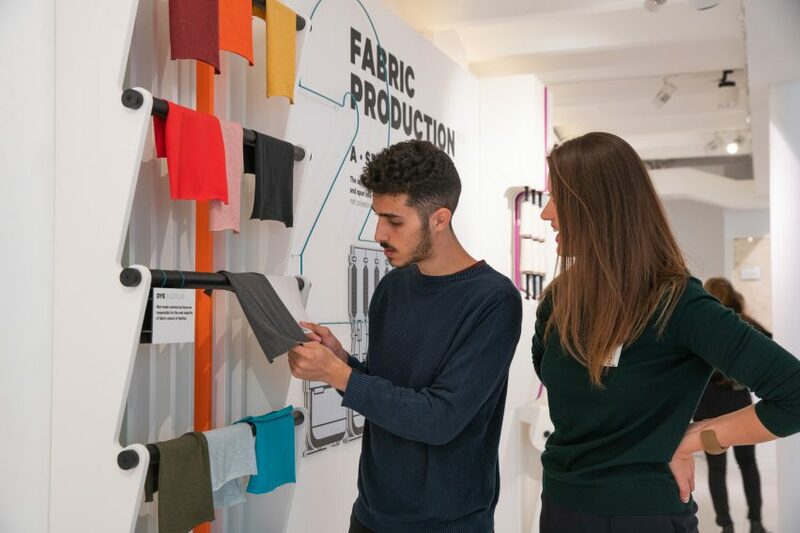 Other innovations on display are “leather” made from apples, biodegradable glitter and blockchain technology, which aims to make the fashion industry more transparent. An “impact cascade” in the lounge offers a quote from each innovator, acknowledging a particular problem and what they intend to do about it. For example: “Polyester, one of the most commonly used fabrics, can take over 200 years to decompose. Mango Materials has created a polyester alternative that is fully biodegradable”. 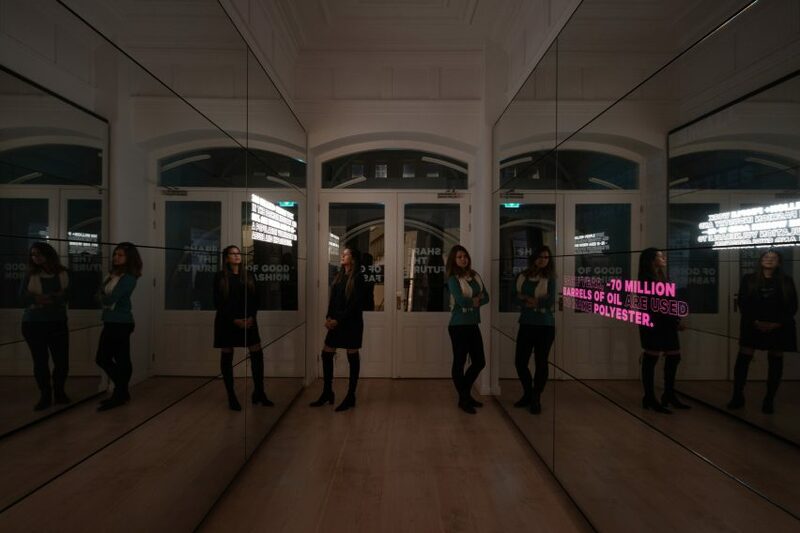 Visitors can also commit themselves to the sustainable fashion cause by taking a kaleidoscopic selfie in the lounge’s booth, which then forms part of an installation alongside other visitors’ selfies. In the Design Studio they can design a sustainable t-shirt that is printed on site. As visitors create the design, images of their work are projected on to the walls of the studio. 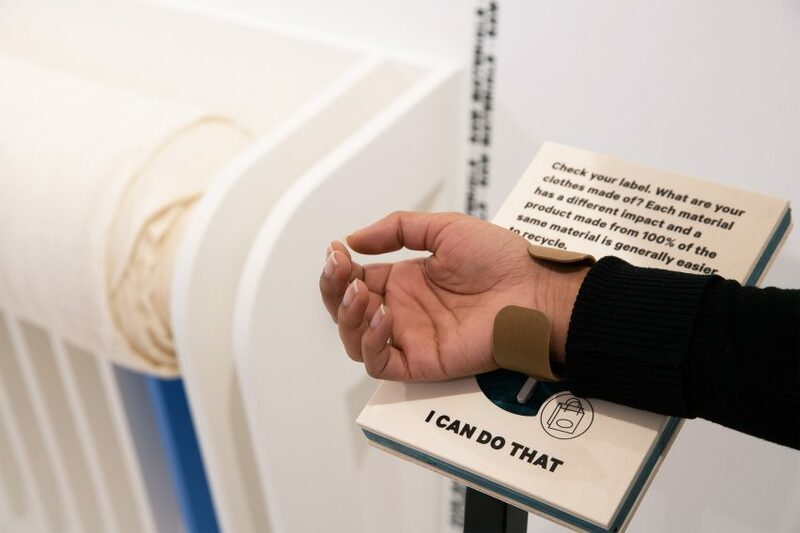 When visitors enter the museum they are given a radio frequency identification (RFID) bracelet made from recycled plastic to wear as they walk through the space. The bracelet collects badges that represent practical actions that the wearer can undertake. These are presented to them as a personalised digital action plan of tips to change their buying behaviour. The bracelet can also be used to purchase items in the shop. The shop only stocks items that are certified sustainable, many of which are products that are highlighted in the Innovation Lounge. The theme of the collections on sale will change every three months, with the first round of stock chosen around the theme of the role of water in the fashion industry. 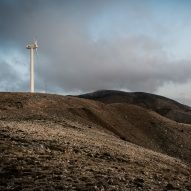 “When we started this project, we were shocked to learn that the apparel industry is among the largest industrial contributors to climate change, including an estimate 1.2 billion tons of greenhouse gas emissions each year,” he said. 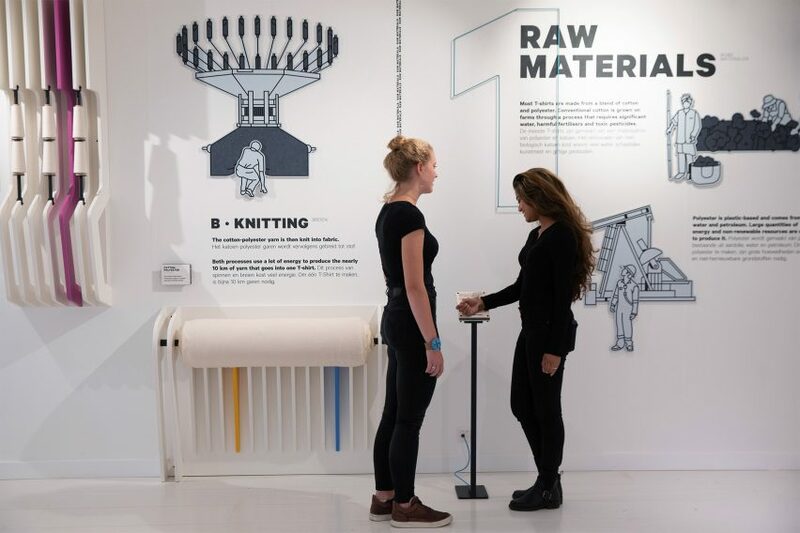 In kitting out the building, the museum sought materials that are cleaner and safer than conventional alternatives and designed for more than one use. Exhibits are lit with natural sunlight where possible to cut back on lighting and electricity usage. “Our co-working and meeting spaces contain a mix of found, secondhand and rental furniture to showcase different procurement models that contribute to a circular economy,” reads a statement on the museum’s website. The phone booths in the co-working space are made from gypsum board that is certified cradle to cradle, meaning it complies with circular economy principles. The booths also contain renewable wool felt accents and are enclosed with recyclable steel and glass doors. The wood panels used throughout the museum come from sustainably managed forests, and the hangers on which exhibits are displayed were custom-made from 100 per cent recycled and compressed paper fibres and are themselves completely recyclable.